In regard to the above subject, we would like to place on record our appreciation for taking steps on ground to revive this water body. We find that pipes are being laid to divert rainwater to the water body. These steps have increased our faith in your command. Theoretically, all plans are implemented for public interest, but, in practice, public interest and the plans do not match many a times. Officers with holistic understanding and a sense of empathy and responsibility to public are always needed to match the two. We feel fortunate to have you at helm of affairs in Dwarka. 1. We had requested for preserving the area around the water body as a community nature reserve, with no disturbance for park like activities or for any ornamental alteration in the landscape. Unfortunately, your staff has gone for landscaping around the water body, destroyed a lot of indigenous vegetation, and some 5-6 year old neem trees around the water body. 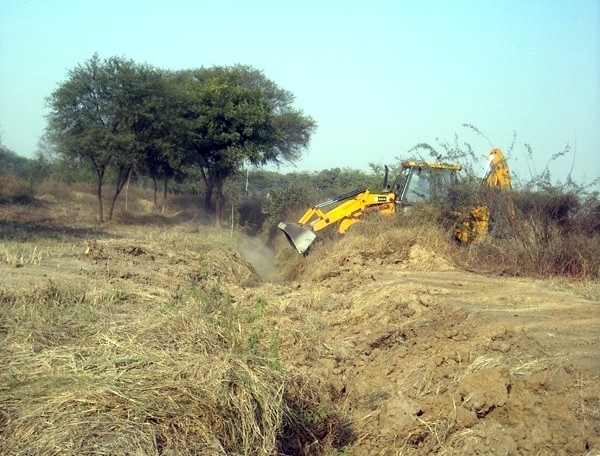 They have used JCB machines to level the area and also reduced the size of water body as well. The walls of the water body that were used for nesting have been destroyed. The surrounding area has exotic wildlife like monitor lizard, snakes and brown hare, and latest we have seen peacock with her chicks. All this can only survive if the natural habitat is not disturbed. Besides, it’s a well known fact that, natural vegetation around the water body plays an important role in cleaning the water that flows in it. Unfortunately, your actions are doing just the opposite. The levelling has resulted in lot the soil going back to the water body in the winter rains and have reduced the capacity of the water body. Please do not disturb the surroundings anymore. Plant some native tree saplings and leave the rest undisturbed for local shrubs and grasses to grow. And, also desilt the water body. 2. As we learnt from discussions with local staff, the plan is to install tubewells to fill the water body. Sir, we find that this is against the concept of a water body, also unnecessary and wastage of public money. The past monsoons, the local residents had pooled in efforts and connected the storm water drain with the water body. To our amazement, the water body was at least filled five times to the brim and it recharged the groundwater. If the residents had more resources and authority, more water could have been channelized and stored and the water body would have restored perennially. Please do not install any tubewells. Some temporary arrangement may be done for this summer for birds and animals. 3. We had requested for demarcation of the community nature reserve using hedge fencing. 4. Your officials are not communicating with the residents at all. As you are doing the exercise on demand of the residents, it would be useful if the residents are consulted continuously. Residents had created a kuccha channel and also used the already existing one to divert stormwater to the water body. Your officials have, at many places, blocked these channels. T some places pipes have been laid. These may be necessary at some places like creating outlets from the storm water drains but can be avoided wheresoever a kuccha channel can do the job. A kuchha channel also support variety of vegetation and wildlife which is not possible in case of pipes. We find that a lot of local vegetation has been denuded to replace a natural channel by pipes at one place. It is requested that the exercise be kept minimally invasive. 5. We find that the storm water drains are sedimented and full with filth and sewage at many places. The clean rainwater that goes to these drains get dirtied automatically. This is what we witnessed the past monsoons while diverting water to the water body. It is requested that all the stormwater drains in the area be cleaned and sewage incursion be stopped. 6. The side walls of the sewage drain passing from nearby is weak and low at one place. During the past monsoons, we struggled a lot to stop the sewage water from entering the channel going to the water body. Due to lack of any support from your local staff, at times we had to dirty our hands in sewage water and also hire implements from a local shop. It is requested that the side wall of sewage drain be strengthened suitably. 7. There seem a long process of tendering or otherwise involved in executing the works. This result in inflexibility and delay in works and at times, leading to detachment of public. It is requested if such a system can be worked out that allow the local staff to work in tandem with residents within some time limits. If it can be created, the local residents are ready to pitch in all efforts, not just for this water body but for all in Dwarka. 8. Dwarka, being a planned city, has immense potential to improve its water supply through developing its groundwater resources. This can be easily achieved by rejuvenating its water bodies. The potential is so high that it can surpass the standards of ancient periods too. This is because of the possibility of all its rainwater being diverted to existing water bodies through the storm water drains. A little calculation can give us the idea. The present Dwarka, approx. 10 sq. kms receiving approx. 60 cm of rain, totals about 6 MCM/year of rain water. Being a planned city, with a network of storm water drains touching all corners of the sub city, almost 50% of this water i.e 3 MCM, by conservative estimates, can be diverted to its water bodies. A water body recharges almost 60% of water that reaches it. This is especially true when the water table has gone low, as it now. Our observations, on this water body this monsoon, revealed that the water was vanishing very fast into the ground. Within ten days, it used to get down by 5-6 feet. If we are able to divert all water from Storm water drains to the water bodies, it can be safely assumed that approx. 1.5 to 2 MCM of water can be recharged through these water bodies. In terms of daily supply, it converts to ~1 MGD. This is considerable, as the present supply to Dwarka is barely 3 MGD. This is a rough estimate but not unrealistic. 9. Seeing your sense of responsibility towards public, we believe we can make the request that the residents be informed on what is being done and what not. We would have highly appreciated if there was a two way communication. For want of any communication from your side, the residents were feeling highly distressed seeing their efforts going waste. A sense of restless was growing. 10. The residents who are involved in these efforts are generally looked at in a somewhat hostile manner by the local DDA staff. They look at us as some encroachers on their territory and authority. This becomes highly discouraging. We wish there can be some attitudinal change.